Make your day a celebration of colour by sticking to a wedding colour theme. We’re predicting 2016 will be the year of “shimmer and shine”! With warm metallic hues coupled with minimalistic yet elegant design are becoming increasingly popular in wedding styling. We are excited to see what our beautiful brides & grooms will bring to the table! Find a unique theme for your wedding day that fits your personal style with these elegant and glamorous looks from our glam wedding inspiration picks. We love the look of these dull gold candlesticks with these blooming beauties! They just look amazing! The simple gold feather detailing against the white cake is bold and chic! The use of a draped sheet in neutral tones frames this intimate and sophisticated garden setting; whilst simultaneously drawing attention to the main focal point – a crystal chandelier. Furthermore, the inclusion of a gilt mirror creates the illusion of a larger, brighter space. One of the easiest and most simplistic ways of incorporating your glam style into your wedding theme is with the likes of china, glassware, and cutlery. Gold rimmed glassware, gold plates, or even cutlery makes for a beautiful look especially if the complementing colour palette is neutral. The same goes with the likes of Tiffany chairs in gold or any other metallic hue to your liking. Gold or copper mercury vases are just as beautiful in rustic glam styling as it brings simplicity with a touch of sophistication to the stage. We love these floral and decor arrangements even though not symmetrical or perfect, they go so well together! While not minimalistic or simple, they really do scream glam! 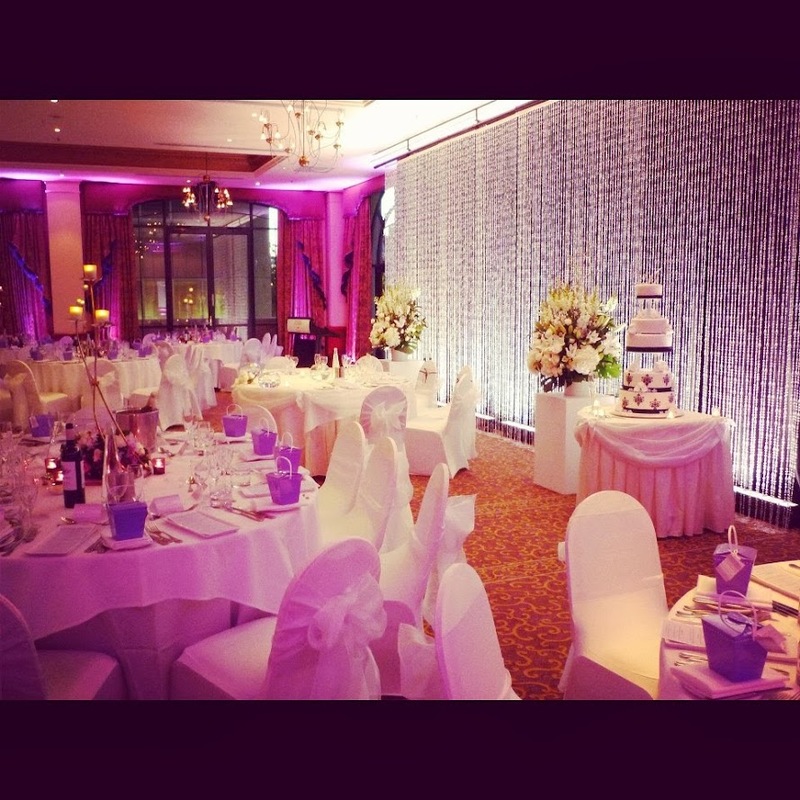 Utilising sequinned tablecloth is a great way of getting incorporating your glam theme into your wedding design. However, what we would really like to highlight is the creative use of the Ship’s Wheel as the base for the floral arrangement. We could not pass on the opportunity to share some out favourite designs that would be ideal for a glam wedding. These designs can be incorporated into any of the wedding inspirations noted above. The saying "Less is More" is paramount when your personal style aesthetic is minimalist and simplistic. Often associated with modern styling in day to day life, minimalistic weddings featuring modern wedding invitations, designs and styles are well received for its sophisticated and polished look. There are many ways in which you create a minimalist modern wedding theme, with ideas from the world over that can transform your wedding into an elegant and sophisticated soiree. What is Modern Minimalist Design? Essentially a minimalist design involves less clutter and items being used. Often it involves clean lines, a few items with white space to let the focal design feature show through. It allows for the eyes to draw up to it giving it the attention it deserves. Colours often chosen for a minimalist design are from the same palette, either on the opposite sides of the palette spectrum of from a neighbouring colour tone/shade. ​When choosing your modern wedding invitations, they should reflect on the wedding vision and the minimalist modern style. A key point to note is to leave items to be open and flowing, with as less clutter as possible. This doesn't mean that you should abstain from using patterns, if used in a simple manner that creates architecture, depth or clarity, then you may do so but be wary that it's often best to use patterns sparingly in order for the focus to go to key design features such as the names of the bride and groom, a monogram or the focal feature. Try to avoid all-over designs when choosing your modern minimalist wedding invitations. With a modern minimalist themed wedding, you're shifting the focus from the various other elements that could take the focus off the VIPs at the wedding - the bride and groom. We've put together a few ideas to make sure the wedding is styled in a way that simplifies and minimises clutter. Ceremony: Use a natural backdrop if you're having an outdoor wedding or a focal background from your venue such as a framed window without creating a separate altar. ​Bouquets: Sticking to either one type of flower, perhaps using one or two colours of the same flower. Wedding Dress: A simple dress that fits your body type well, with as little lace, embellishment, or bead work is recommended to stay in line with the minimalist style. Full of wonder, fun and colour, whimsical designs can be found around you in everyday life, but when you are planning a wedding, these details are often magnified to be larger than life. With unique wedding invitations, themes and decor accents, you've got yourself a wedding that your guests will be buzzing about for ages! Here are some unique wedding planning ideas! One of the most prominent features of a whimsical design theme would be colour and coupled with delightful patterns. Polka dots, stripes, chevron and more fun striking patterns and fun design elements are great ways to add whimsy into your wedding theme. By customising those very patterns and designs with vibrant and bold colours, you're setting the stage for a truly memorable and whimsical inspired wedding. This type of wedding is ideal if traditional design isn't your personal style! It's the perfect look for a quirky and unique couple that are looking to break away from the traditional wedding mould to create a wedding style that is 101% theirs. By experimenting with unique shapes and looks, you can transform it into your wedding own custom look. Start with a wedding inspiration board putting together different ideas for you to blend together beautifully to make a cohesive yet whimsical wedding theme. Some couples truly revel in adding their very own custom designs such as their own handwritten notes included in the design of the wedding invitations, to adding doodles or hand-drawn caricatures that will reflect what's to be expected on the big day. You can carry the very same look and design onto other aspects of the wedding day such as the welcome sign(s) and other wedding stationery to the wedding cake and wedding bombonieres. Once you have your wedding invitations & stationery planned out and all you need to decide is the quantity you will need (in terms of the wedding stationery, the quantities can be decided closer to the wedding date once guests have RSVPed). You need to think about the way you will style your decorative elements for the wedding such as the altar design, the tablescapes and more. Some opt for a garden inspired and other unique looks such as carnival to wonderland inspirations. A beautiful garden inspiration would be a hanging wisteria garden look for the wedding ceremony (whether indoors or outdoors) or if you fancy something more rustic yet full of fun and whimsy, a colourful themed overhead altar with life-size pinwheels. You can even use them instead of bridesmaid's bouquets, boutonnieres and hair accessories. Carnival themed weddings are usually the most common choices for whimsical weddings, but there are fun ways to customise these too. For example, you can trade in a typical photo booth for a kissing booth instead! "She leaves a little sparkle wherever she goes" said Audrey Hepburn; a little sparkle never hurt anyone so why not choose a wedding theme full of sparkle with glitter wedding invitations and more wonderful theme styles to go with it. Here are some ideas for the wedding invitations, colour schemes, and styles for your glitter wedding. Adding a little glitter, sparkle and shine to your wedding via invitations and/or wedding stationery is a perfect way to preview the theme in mind with a bang! However, make sure you fine tune the theme before you commit as you don't want to "blind" or "overdose" your wedding guests with too much sparkle. Moderation is key here! 4. Glitter envelope liner to match wedding invite. Add a foil envelope seal to the back of the envelope as a personalised finishing touch. When you're planning on styling your wedding with glitter and sparkle, be wary that too much of it can overpower your guests and can take the focus off of the bride and groom, and quite possibly lean towards being gaudy as opposed to elegant/classy. Make sure to limit your use of glitter and sparkle to a few areas of your wedding such as the wedding invites, the wedding dress choices and accessories for the bride and bridesmaids, and possibly accenting the wedding cake and using a toned down design taken from the wedding invitations to be used in the wedding stationery. When it comes to styling the beautiful bride, you can opt for a modern white wedding gown with use of embellishments to bring in the glitter & sparkle theme into play. Using an embellished bodice or even an all-over sequin wedding dress for an ultra modern twist with a 1920s style inspiration, to even adding accessories as a neckline jewelled shrug, jewelled hair accessories, crystal bridal headband or diamante bouquet ribbon wraps are great ways to incorporate the design to bring the focus to the beauty of the day (or night). But that's not where the shine stops. You can have yourself a faux diamante inspired wedding cake or even one with edible glitter used stylishly. Don't forget to send off the newlyweds in style! Sequin confetti and sparklers are great ways to let your sparkle shine through! With these great wedding design tips from the wedding invites to the send-off, be inspired to create a glitter and shine wedding just for the two of you! For those in the lower hemisphere, it's already autumn, while for those in the upper this beautiful season is a few months away. If you're planning a wedding to be inspired by this beautiful time, keep reading and find out the autumn inspired wedding invitations and themes you can use for your dream wedding day! First off, let's look at the various items that you would generally associate with autumn. Apples, pumpkins, pine cones, acorns, golden-red leaves, wheat and more. These are all ideal to use for your wedding day, whether it's an outdoor or indoor wedding. Secondly, your wedding location matters too. If you have selected a picturesque venue for your wedding, you can easily incorporate it into your autumn wedding theme, even including a photograph of it via a photo wedding invitation. Infuse the red and gold highlights into your wedding theme and transform it to a dazzling wedding theme, full of fire and warmth. Choose to buy the best wedding invitation design that will match the autumn theme you're envisioning. It all starts with an inspiration or an idea. Would you prefer a photo wedding invite? Perhaps you would prefer an abstract or textured design? Often couples planning an autumn wedding prefer a rustic look, so you may even find using recycled Kraft paper ideal! By choosing an online wedding invitations shop that offers personalised touches and even custom designs, you're able to get the desired finish and quality without the commute. By communicating with the invitations design team virtually, you need not even leave your house (let alone wear pants)! Make sure to get samples so you can see firsthand the quality and the look of the wedding stationery designs you are after. If you're having an outdoor wedding, make sure to provide blankets, or even a bonfire or brasserie for your wedding guests to keep warm. Some great ways to stay within theme would be to style your wedding buffet with fun Autumn inspired food such as a pine cone cheese ball, candy apples, and pies (such as pecan, pumpkin and apple)! In terms of decor, you may look towards various themes, from your favourite autumn fruit (apple) to vegetable (pumpkin), but you can look at the bigger picture such as a harvest themed wedding with wheat being the focal decor factor. Stay tuned to our social media accounts for great autumn wedding invitations and theme ideas & inspirations this week! Winter is a beautiful time; icy but wonderful in its entirety giving you a natural backdrop to the most important day of your lives - your wedding day. Many assume that a winter wedding may be a bit of a hassle but there are so many ways to make this time joyous and fun, with the elegant and sometimes fun additions. A silver winter wedding theme would be a magnificent choice and you can kickstart the wedding hype with gorgeous silver wedding invitations. If you're wondering what is in store for you when you decide on a silver winter wedding, we've got a few ideas up our sleeves from winter wedding invitations, the choices of venues and clothing for the big day, and even complementing colours to add a beautiful pop to the silver winter wonderland ensemble. Keep reading! You will be inspired! There are some beautiful choices of printed wedding invitations that are perfect for a winter wedding with its silver undertones such as "Winter Garden" by DreamDay Invitations which features an intricate flourished border with flower details in lilac peonies and pansies. However, to add more glitz and glamour to the silver wedding invite ensemble, you will find more and more couples to be wed are choosing luxury to handmade wedding invites for their weddings. There are various wedding invite designs (also by DreamDay Invitations) that features specialty wedding papers with embellished treatments such as embossing, flocking and glittering, makes for a great impression. Find inspiration from these silver wedding invitations that are perfect for your winter themed wedding. Don't forget to discuss the vision with the DreamDay design team so you can get exactly what you envisioned! When its winter most couples would lean towards an indoor wedding and depending on your overall wedding style it can be anything from a beautiful and classy reception hall with high ceilings, drapery and lighting to a barn or cosy cabin for a warmer yet beautiful wedding day. If it's a daytime wedding, you can make the most of the white winterscapes and even make plans to have the wedding ceremony outdoors. However, if the weather doesn't permit it, you can style the aisle and alter to frame a window where your guests can glimpse at the falling snow. When you choose a metallic hue such as silver to complement your wedding theme, you're instantaneously alleviating the look to one that is classier. Therefore if you choose to add a pop or hint of colour to the look, you are still getting an elegant look because white with silver and a pop of colour be it red, deep brown, or navy can really complete the look. Also, just because its cold doesn't mean you have to compromise on the beautiful wedding dress you have had your eye on for a while. With elegant and styles choices of cover-ups such as shawls, shrugs and boleros, you are all set for a classy silver wedding. Don't forget to make your wedding guests comfortable too. Offer silver white throws to warm up, and don't forget the silver themed cocoa bar, complete with matching cocoa mason jar bombonieres! Theme the various wedding stationery after your silver wedding invitations for a seamless flow between all the highlighted wedding elements, it'll truly be a winter wonderland wedding. Purple has long been considered a "special" colour from the olden days, where it took a significant amount of effort to come about this colour dye and was set aside for royalty or landed gentry. It's a popular choice of wedding colour, especially in pastels and used for wedding invitations, decor, clothing and more. Look around you, what strikes you as perfect may just be staring at you right in the face. Look at flora - lavender, hydrangeas, orchids, water lilies and even carnations hold beautiful shades of purple and are ideal as you can use them in other wedding aspects such as the decor and the wedding bouquets making then blend beautiful with ease. These looks can be further elevated by the style you pick -whether traditional, elegant, modern or themed. You will find that ombre shading is still very popular and can look very appealing when styled with other wedding items such as the wedding cake and even the Bridesmaid's attire. If you're looking for a unique look, choose purple wedding themes that feature styles and designs taken from Asian, Bohemian and even Steampunk inspirations. We've put together some wedding style inspirations that combine purple with complementing tones and how you can go about designing the best wedding look for your dream day wedding. Pastel tones with one bold colour is a popular trend this year, with purple taking centerstage and accompanied by softer hues in the same colour palette and also by complementing colours too, such as yellows and beige. Here are some choice purple wedding colour combinations that are just perfect ranging from elegant to modern and offbeat styles! Lavender Inspired: These can feather lavender wherever seen fit but it's best to hone in on simplistic colours as the vibrancy of the purple/lilac hues will show through especially against white. Deep Plum Purples: You can use darker shades to create an elegant look that's muted yet throws a punch. Bold Pops of Purple: Much like the deep plum purples, you can use this sole bold colour to create a seamless look. As this is such a bold colour, it is often that a Modern wedding couple will opt for these. Ranging from traditional, elegant, contemporary and modern, there are many choices for your to choose from, especially if there is a theme you would like to personalise too. With inspirations such as these for your wedding, you are set. Complete your wedding stationery suite with DreamDay Invitations by browsing the various customisable designs available at the online stationery shop. Contact the DreamDay Invitations Design Team to personalise your wedding stationery according to your wedding vision. We're making our way into the second season of the year. If you're sitting down to figuring out your wedding style and you're wondering what wedding invitations trends are taking the world by style, we've put together some choice wedding trends with pointers from Elizabeth Mitchell and Debra Witt of Brides and Bridal Guide fame! Illustrations: Many brides and grooms have loved this option because it puts a unique and personal twist on the wedding that moves away from the traditional minimalistic appeal. However, nowadays you can find illustrated wedding invites that are stylised with choice colours to achieve the maximum wow effect. You will see flourishes and leaf designs, to border art and more. Hand lettering Designs : This means to say lettering that looks like handwriting or even, drawings that look like it's been written. It's quite the rage and looks lovely when finished. What most brides are opting to do is choose printed wedding invitations designs that make for an affordable invitation option. Bold Colours and Contrasts: Colour, colour, colour; it's all about colour! You will find this goes hand in hand with hand lettering and also illustrations with pops of colour whilst the colour of the paper is often white for that stark contrasting effect. Woodland Accents: If it was ever the time for the world to be eco friendly, it's now. Choose recycled paper (of the PCW paper variety or otherwise) for your wedding invites and match it with woodland designs and effects such as with bark designs or illustrations too. Embellishments: For the traditional brides and grooms who do not favour too much contrasts and pops of colour, and lean more towards quality paper stock, trims and embellishments, you will find it's your year with ribbons, buckles, clusters and appliqués being much in favour. Choice of Paper: Quality paper that often mimics or resembles the bride's wedding dress is a favourite amongst many brides, so you will find that this trend is one that many couples to be wed will look to. Photo Invitations: Photo shoots for wedding invitation cards are fun to make the wedding planning process more memorable as well as it makes for great keepsakes for the wedding invitees too. More and more couples are looking to these designs for its unique and personal effect. Be inspired by these great wedding invitation trends to style and design your wedding to be a memorable and wonderful affair! What has your idea of the perfect wedding been ever since you were little? Did you ever dream of getting married in your mother's wedding dress? Were you delighted by the look of traditional wedding invitations, the purity of white with lace detailing, and the ethereal look of bridal innocence that goes with a traditional wedding style? Colour: White is the popular choice of colour for traditional weddings; however you'll find that when it comes to printing the invitation wording, black on white is a preferred choice. There are many brides and grooms that prefer to use neutral colours too, often coupled with white such as ivory, beige, gray and light pastel shades. These are further accentuated with the choice of design elements used. Depending on the traditional design choices that strikes a chord with your sense of style, you will need to select a the right choice of colour for ​your wedding invites to take after it. Design Elements: When you take traditional design elements, they are almost always elegant and classy. As colour plays a great role in the final look, choosing a few options of designs and colour is always a good rule of thumb. Lace designs have always been considered a traditional design style that is immensely popular with wedding design. Most of these traditional designs are derived from historical decades or eras from various countries whether it's from Russia, France, Britain and more. You can be inspired by Imperial Russia, Renaissance, Victorian times and more. You will find designs that have intricate patterns and focal designs, such as filigree, flourishes, and damask to name a few. 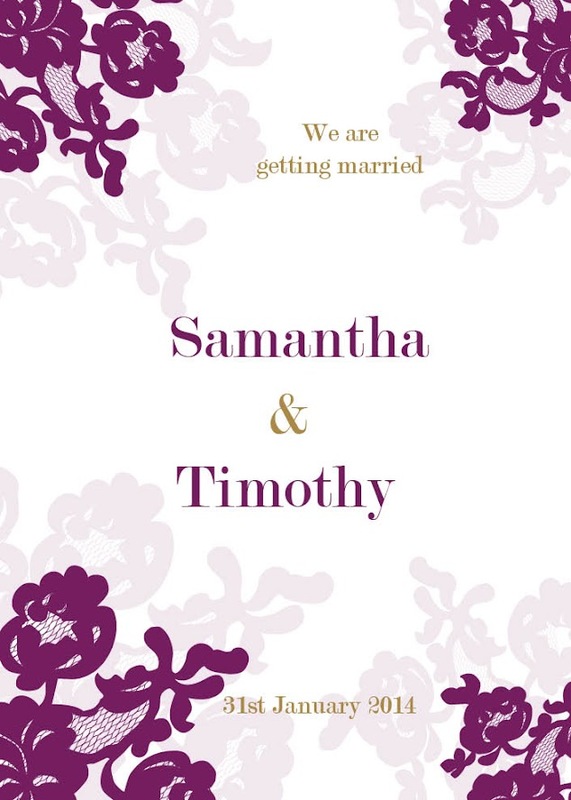 You will also find that these scripted or serif fonts are best suited for traditional wedding invitations. Trims: Adding a classic decorative item to your wedding invitation design can definitely make an impact on the overall look and style. For example, if you opt to use ribbon along with a pretty faux diamante square, circle or heart shaped buckle, it'll be a very appealing. The same applies to using clusters and brooches coupled with satin ribbon styles and even lace trims to further enhance the look of your traditional wedding invite cards while keeping in line with an elegant and classy style. Specialty Treatments: These specialty treatment styles can be anything from using treatments done directly onto the invite paper or cardstock, or you can use wedding specialty papers that can be used to stylise the traditional invitations. These can range from embossing and foiling treatments on the invitations while you can use embossed, foil printed, glittered and even flocked specialty card stock to accessorise the wedding invitations too. There is something truly marvellous when you put beautiful art into use with joyous occasions. It has the ability to capture or reflect on the moment and the feeling in a beautiful way. That is one reason watercolor wedding invitations have become so popular in the wedding industry worldwide. You are given many ways in which you can be inspired to use watercolors in your wedding. One such way would be to use it for the save the date card that may be the first point of contact for your intended wedding guests. However, if you are not going to use save the dates, then your watercolor wedding invitations will be the great unveiling of the good news! The watercolor drawing or effect you have selected can even be used in the wedding website if you are setting one up. Thereafter on the day of the wedding, with concern to your wedding stationery that may be used for the ceremony and the reception inclusive of welcome signs and directional signs, to table accessories and more, you can feature the watercolour design throughout. There are many watercolour techniques that are popular with wedding invite designs, they include the likes of abstract designs, typography, illustrations and scenic drawings. These are all ways in which your watercolour card can stand out from all the other wedding invitations out there in the world. Let’s take each type, one at a time. Abstract Watercolor Designs on Invites : This can be of any design, be it with water stained look, splashes and splotches, to streaks or any other abstract designs within the same colour palette in the same shade/tone or even a mix of various complementing colours that blends well together. Watercolor Typography Invite Cards: This is when you have specific words or even the names of the bride and groom set out in watercolour, usually set in a calligraphic manner. These are ideal depending on your colour palette, whether in the same colour tone/shade or different hues blended together for a unique look. Illustrated Watercolor Invitations for Weddings: When it comes to illustrations, there are various ways about it. It can be of flowers either as a focal element or as a patterned backdrop or borders, to various other inspirations. Once again colour against tones/shades plays a big role but having the invitation wording is set apart can make it stand out prominently. Scenic Drawings on Wedding Invites: These are quite unique to a setting, and preferably would require an artist to draw out what you have in mind. Once you know what you would like to feature on your wedding invite card, such as a picturesque setting of the wedding venue, you can have that painted in watercolour and then used in your wedding invites. A great way to do this when you are working with printed wedding invitations retailers is to have an artist draw it up and scan it in high resolution, and then send it to the wedding invitation shop to add it onto the card of your choosing for print. Quite simple and easy to do, especially with a reputed unique invitations shop that offers various value added services to their customers.